Some species belonging to the Annelida, a group that includes the sea worms used as bait in fishing, live in a tube which they build themselves: these are known as sedentary Annelida. The brightly colored branchial plume which sticks out of it traps oxygen, as well as the organisms which make up zooplankton. 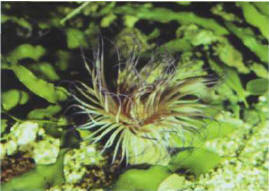 At the sign of any danger, or if the tank or its support are knocked, this branchial plume retreats into its tube. The feeding of Annelida in captivity is identical to that of Coelenterates. When you buy one, make sure that the branchial plume is functioning correctly and its tube is intact. It is best to buy a worm fixed to a piece of rock. In an invertebrate tank the development of algae must be restrained, so that they do not smother the Coelenterates (left, a Cerianthus). 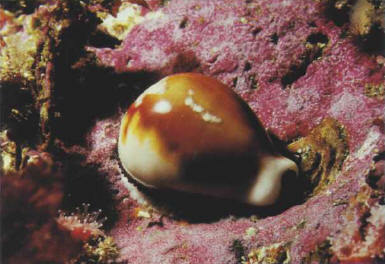 This cowry has withdrawn its mantle into its shell. ЭКОНОМИЧЕСКАЯ КОМИССИЯ ООН ДЛЯ АФРИКИ (ЭКА) , постоянный орган Экономического и Социального совета ООН, создан в 1958. Занимается проблемами экономического и социального развития стран и территорий Африки.